What do you do when the best gel ink pen gets an update? You buy a bunch of them of course! One of my all-time favorites, and my number one ranked gel ink pen for as long as I can remember, the Uni-ball Signo UM-151 0.38 mm is now available with a needle point. Any time I am asked for a gel pen recommendation, especially in a micro-tip size, this pen is my answer. And it’s not really close. While I repeatedly profess my love for the Pilot Hi-Tec-C, and the Zebra Sarasa Clip is wonderful in its own right, the Signo UM-151 is a step above. If you prefer a needle point over a conical tip, then this is a pen you will want to try out. Aesthetically, the needle tip model is nearly identical to the standard version. There are a few cosmetic differences, such as the addition of the racing stripe down the barrel, but otherwise, this is the same barrel, same grip, same cap, and same ink. And that’s good in my book. The only thing missing on this model is the DX marking, which I never knew why that existed in the first place or what it meant. It was easier calling it the DX though, as opposed the the UM-151, and now the UM-151ND. Writing with this pen is a complete joy. The lines are fine and sharp, and the colors are rich and saturated. If you are a tiny writer like me, it’s practically perfect. I’ve never had a Signo UM-151 fail to work when I need it to, like the Pilot Hi-Tec-C. I’ve never had the ink run out quickly, like the Zebra Sarasa Clip. Uni-ball has set themselves apart with this pen. And it is only marketed and sold in Japan. 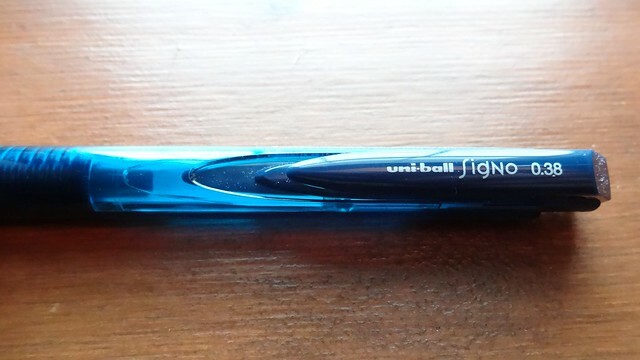 Uni-ball clearly knows this pen is a success, so why isn’t it on store shelves around the world? Sure, we can all get them through importers like JetPens (thank goodness! ), but I find it odd that this isn’t more widely available, at least in 0.38 mm and 0.5 mm sizes. The Signo 307 is the store shelf pen for Uni-ball, comes in many colors, and is amazing in its own right. I don’t see why the UM-151 isn’t out there more alongside it. Speaking of colors, I grabbed my favorite five: Blue Black, Lime Green, Violet, Light Blue, and Orange. In the past, I would grab three of them to take notes at work so I could have tasks or similar details color-coordinated. These days, I’m a single color note taker, but like having the color options available. Blue Black is my go to, but I mix in the others frequent enough to get used. And there are 10 more colors to choose from, with possibly more to come. Bottom line: This is the best gel ink pen on the market. It’s always an enjoyable experience whenever I pick one up, and I always make sure to have one - or more - within arms reach. Posted on June 26, 2017 by Brad Dowdy and filed under Uni-Ball, Signo, Gel, Pen Reviews. I have enjoyed the retractable Signo RT series of pens for while now and they have been working well as-is, or at least so I thought. Uni-ball recently released an updated version of the Signo RT called the Signo RT1 with a sleek new body and a tip design that provides a smoother writing performance that the original. The new body style of the RT1 really caught my eye the first time I saw it. It has a unibody design that looks like it’s made from one continuous piece. The bottom part of the pen near the tip is made from smooth rubber that is comfortable to hold for longer periods of time. Unlike the grip of the RT that stops near where the pen tapers towards the tip, the RT1 grip continues on to the very end of the pen. If you like to hold the pen near the tip, you still have a nice grip for your fingers to hold on to. The main body of the RT1 is made of a translucent color that reflects the color of the refill you prefer and is see-through enough to allow you to see how much ink you have left. It’s an excellent feature and makes the RT1 feel like a streamlined, stylized pen. The RT1 also has a clip that is integrated with the click mechanism. This causes the clip to move when you extend and retract the pen instead of being stationary on the regular RT. 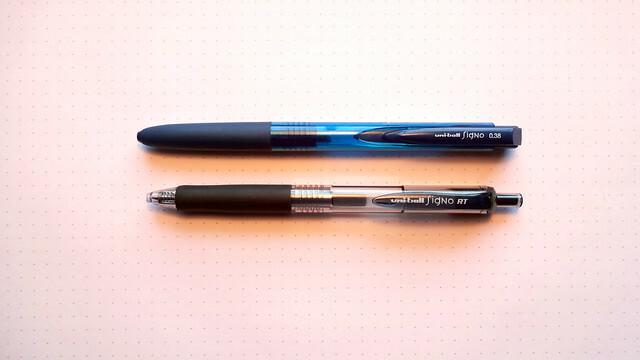 Comparing the line quality of the original RT to the RT1, the RT1 has the smoother writing experience. The RT1 just glides across the page without any effort required. It creates a smooth, dark, fine line that does not skip across the page. The RT, in comparison, almost needs a bit more pressure to use since it tends to drag across the page slightly. This causes the RT to have a scratchy quality when writing. Maybe it’s this particular RT refill I currently have or I just never noticed the scratchy quality until now. Despite the many positive elements, the clip is one of the worst things about the RT1. It is too flexible and doesn’t feel as secure as I would like. This is something that could break off after frequent use, especially if you are one that likes to fiddle with their pen clips. Another problem with the RT1 is the retracting mechanism. When you press down on the click mechanism to extend the refill, the clip and mechanism tend to rattle back and forth when you lightly shake it. This would be a huge issue if this occurred while you were writing but thankfully that does not happen. The rattling isn’t too distracting unless you are waving your pen around like a crazy person with a purpose. ￼Besides the minor issues with the clip and click mechanism, this is a great pen to carry away from home. The updated barrel design is nice, and the line is smooth and dark. The RT1 is $2.50 at JetPens which is slightly more expensive than the RT but it is well worth paying an extra dollar for. It’s hard to complain about a pen that works consistently every time you put it in use. 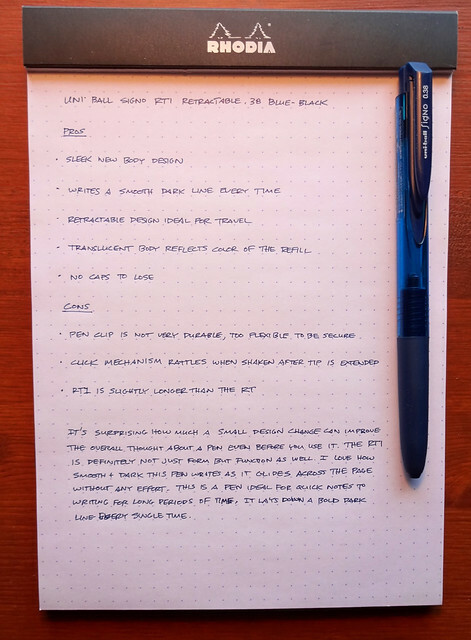 Posted on May 6, 2013 by Brad Dowdy and filed under Signo, Pen Reviews, Uni-Ball. 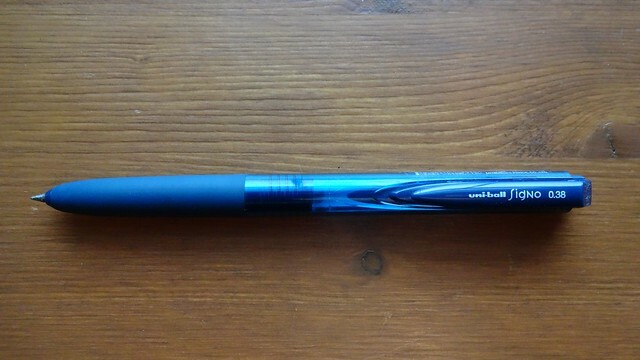 So, is the Uni-ball Signo 207 Bold a new product, or not? I don’t recall ever seeing these on the store shelves before, and some of Uni-ball’s packaging had the “New” splashed across the front, but I have a few questions. One, according to Amazon.com, they have been around for a while - at least since last summer. The picture even shows the old packaging, while the ones I bought were in the new packaging. Secondly, the Uni-ball 207 Impact Bold has been around for ages. I don’t have one handy to test with, but it is a 1.0 mm 207 model Super Ink Technology gel ink pen. Is this the same refill just now in the standard 207 barrel? Finally, isn’t is weird that I get so worked up about little things like this? I’m not really that worked up about it. I was thinking this was a new addition to an already solid product line, but it is really more of a rehash/rework of some pieces that were already in place. Once I got down to actually using the pen instead of trying to decipher its lineage I found it very enjoyable. It is hard for a gel ink pen this wide to dry in a reasonable amount of time but the 207 Bold dries as fast as any. It certainly dries faster than the Pilot G–2 1.0 mm. The line is solid, smooth, and dark as well. It was a great writing experience and I can see myself using this pen more than I originally intended. 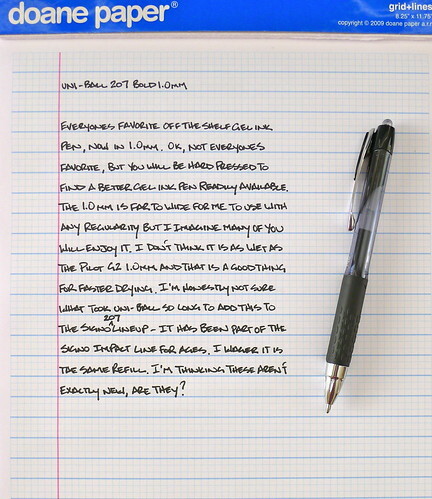 Posted on April 27, 2012 by Brad Dowdy and filed under 207, Pen Reviews, Signo, Uni-Ball.